Over recent years, Adrian Bott has become widely known for his annual deconstruction of the myth that Eostre or Ostara was a widely worshipped goddess in Northern Europe, and that she was associated with rabbits, hares, and eggs. In the course of his research, he has discovered a number of other interesting things, some of which are explained in his article for The Guardian, The modern myth of the Easter bunny. So I asked him if he would like to do an interview on the subject of Eostre and Easter. 1. What got you interested in this topic, and returning to it every year? My interest in festivals, pagan and otherwise, goes all the way back to my earliest involvement with these matters. Like so many others, I absorbed the myths uncritically and welcomed the ammunition they seemed to give against an overarching, oppressive Christianity. Being able to claim ‘we were here first’ is empowering for pagans, especially young ones. Back in those days, there weren’t nearly so many of us as there are now. As for my interest in debunking the myths surrounding the festivals, well, that comes a lot later in life. I ran an occult bookshop in Manchester for ten years, which put me in a wonderful and enviable position: access to all the literature I could ever want! The more reading I did, the more holes appeared in the popular ‘Eostre’ narrative. I got into the habit of checking sources rather than simply accepting material at face value. It became rapidly apparent that a great many supposed ‘facts’ were nothing of the sort, and were only being repeated because they told people things they wanted to hear. I wrote a rough-and-ready article for White Dragon magazine back in the early 2000s that started the ball rolling, and since then it’s become a sort of annual tradition to drag it out and get the weary work of debunking going again, because every year you see the same codswallop circulated. In my view, people deserve better. 2. Why do you think it is so important to be historically accurate in the presentation of myth and symbol? Well, that really depends on the context. I’m not saying that anyone has to be historically accurate (which is hardly achievable, let’s be honest!) in their spirituality. People have an unassailable right to interpret the divine, however they may see that, in their own way. The last thing I want is to be seen as some sort of pompous pagan bureaucrat telling people the figures on their altar don’t properly reflect the latest archaeological or academic discoveries. But I do think that pagans, of all people, have an ethical obligation to respect the historicity of the stories they tell, especially when they are telling them to one another. I think we have to do more than pay lip service to such things as lore, tradition, and ‘old ways’. That means recognising the boundaries of our knowledge. It’s no shame to say ‘We do not know what the absolute truth of this matter is’. Stories can emerge from the shadows. Where there’s doubt, there’s room to breathe. As I see it, to say ‘We do not know for sure whether Eostre existed as a figure of worship’ is far more liberating, far more honest and far more empowering than to say ‘There WAS an Eostre, there HAS TO have been, she DID SO exist, and she had a sacred bunny too.’ The problem with the latter approach is that it standardises the myth. It reduces all that cryptic, compelling potential to a mere lump of monolithic propaganda. The discipline of the historian, as I see it, is something to be treated with reverence, especially by people who purport to be custodians of the past. It’s bitterly ironic that so many pagans depend on the ancestral past for their sense of identity and yet blithely ignore the findings of academic historians in favour of flavoursome lies that they think empower them. 3. Do you think that a certain amount of the spurious notion that “the Christians stole our festivals” (CSOF) has fed into the modern Eostre myth? Do you think this idea is dangerous? Why? Yes on both counts. I’d go so far as to say that the whole purpose of the modern Eostre myth is to undermine the Christian Easter, for entirely understandable reasons. I don’t think they are good reasons, but they are understandable. There are many reasons why the idea is dangerous. Firstly, it peddles a facile and diminutising version of pre-Christian history. According to the CSOF line, there was one group of people called The Christians, and another group called The Pagans, and The Pagans had celebrations on the equinoxes and solstices, and these celebrations were usually about Fertility and about Goddesses, and along came The Christians and they forced all The Pagans to convert, and to make this easier they took all The Pagans’ festivals and Christianised them. All this is meant to have happened in some ill-defined but vaguely European space, during some unspecified time period when things were very muddy and bloody. The second reason the CSOF line of argument is dangerous is that it’s flat out wrong. It treats Gregory’s letter as some sort of absolute rule obeyed by all The Christians at all times and in all places, rather than as the passing notion it actually was. In the particular case of Easter, it’s painfully easy to explain why Christians didn’t ‘steal’ it. The antecedent of Easter is Passover, Christ being seen as the ‘Lamb of God’ and the perfect Passover sacrifice, and the date of Easter was decided by the early Church in reference to that tradition (though there was a good deal of argument as to when the date actually was – google the Synod of Whitby, for example). For this reason, almost all countries call Easter some variant of ‘Pasch’. It’s only in a relatively small part of the world that people called it Easter, and the only reason why so many people call it Easter now is because of the dominance of the English language. The third reason is that claiming Christian festivals as somehow ‘pagan’ is exactly what certain fundamentalist Christians want to do. In fact, a good deal of the impetus to deem Easter and Christmas essentially ‘pagan’ comes from that quarter. 4. Do you think it is acceptable to present Eostre and her bunnies and eggs as a modern myth, if we don’t claim that it is ancient? Can we still have our chocolate eggs? Absolutely! Again, the whole intent here is not to demolish anyone’s personal take on the season, or whatever Goddesses they may choose to honour. The provision of meticulously gathered historical research is meant to be a positive thing, not a negative one. I don’t really see myself as a debunker, when it comes down to it. I’d rather be the kind of person who opens the door to the rich possibilities of doubt and uncertainty. Let people see their own faces in the flames and forms in the shadows; let them make their own links with the mythic past and fill in the blanks with their own inspired imagination. We don’t need some standardised bubblegum Eostre, complete with bunny, presented as if it were a fact. Debunkers in general need to be careful, I think. The late Terry Pratchett, who was a very wise man indeed, wrote a book called Lords and Ladies. In it, the young witch Magrat Garlick encounters a painting of the famous Queen Ynci of Lancre, a Boudica-like warrior woman. She later finds Queen Ynci’s armour and wears it to defend a castle against attacking elves. In doing so, she feels as if the spirit of Ynci is with her, helping her, making her brave. Through Ynci, she is able to do things she normally wouldn’t dare to do. Later, Nanny Ogg and Granny Weatherwax are talking together, and we learn what Magrat didn’t know: Queen Ynci never existed. She was invented by a former King of Lancre to add a bit of romantic history. He even had the armour made, hammered together from an old tin bath and some saucepans. Granny Weatherwax asks Nanny Ogg ‘But didn’t you think you ought to tell her that?’ and Nanny answers ‘No.’ Enough said, I think. 5. Is there another myth associated with the Spring Equinox that people could create rituals with? Nowadays, there are an abundance of myths about the Spring Equinox – take your pick! However, we do run into a bit of a problem in that the celebration of the Spring Equinox per se doesn’t have much of a European pagan precedent. You see, Eostre’s festival (if it existed) wouldn’t have been at the Spring Equinox at all. Eosturmonat, as Bede attests, was the FOURTH lunar month of the Anglo-Saxon year, corresponding roughly to April. This is how come the Christian festival of Pasch coincided with it. Pasch is dated from the Spring Equinox, but does not happen at the Spring Equinox; it falls in April more often than not. The practice of celebrating the Spring Equinox in this context at all owes much more to the Golden Dawn than it does to ancient pagan tradition. Certainly, calling the Equinox ‘Ostara’ is an entirely modern practice. But so long as we’re aware of that, we can celebrate how we like. Easter traditions, whether or not they may be pagan in origin, are not ‘Spring Equinox’ traditions. If the German Ostarmonat and the Old English Eosturmonath do indicate a spring festival, then it is to those months we must look for the folkloric antecedents of Easter, and not to the Equinox in March. Until the mid-20th Century, according to older literature, it was mainly the Easter Fox who was responsible for the eggs in the Easter tradition. Gradually this was then displaced by the Easter Bunny. A note of 1904 from the Schaumburg area states quite specifically that the eggs were laid not from the Easter Bunny, but the Easter fox. Traditionally, on Holy Saturday the children would prepare a cozy nest of hay and moss for the Easter Fox. They also made sure that the Easter Fox was not disturbed during his visit – for example by shutting up pets for the night. Furthermore, the Easter Fox was described in a Westphalian document of 1910. Interestingly, the tradition seemed at the time to have been in a transition period to the Easter Bunny. 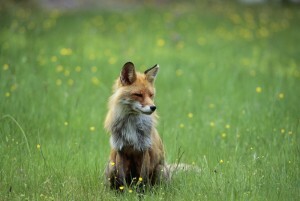 Thus we read in Scripture that “… it would look as though the Fox might return before the hare. ” Where the Easter fox comes into the story, we can only surmise today. It was considered early on that it is based on the Pentecostal fox. This is an old custom in which people at Pentecost went with a pet fox from house to house to collect donations. Other descriptions suggest the Easter fox harks back to the tradition of Christmas Gebildbrot pastries. I have no evidence whatsoever that the Easter Fox represents a survival from pre-Christian times. But wouldn’t it be a wonderful myth to work with? The only reason anyone thinks Eostre had a rabbit (or hare) companion is because of Jacob Grimm, who in Deustsche Mythologie states ‘Probably the hare was the sacred animal of Ostara’ without any direct evidence at all. The notion has become incredibly popular, though, because everyone’s heard of the Easter Bunny, and claiming things everyone’s heard of in the name of Paganism is a tiresomely common activity nowadays. 6. Can you tell us a bit about how you celebrate Spring Equinox (if you do)? 7. Can you tell us a bit about your Pagan/magical path? I rarely ever talk about my own beliefs and practices. This is a consequence of my days running the occult bookshop up in Manchester. If you’re going to deal with all paths impartially, you can’t be seen to be on any given side. The moment you are thought to be part of a given group, people naturally and automatically assume biases and prejudices, whether you have them or not. So I always kept my own beliefs out of the picture. I don’t really like ‘paths’, as a rule. A path, by definition, is something someone else has walked before you. Unless you’re hacking your own idiosyncratic way through the scrub, it’s not really your path at all, is it? On balance, I think I’d rather have a magical machete than a magical path. The most pernicious thing about the popular Eostre myth – the whole spring goddess with the egg laying bunny bit – is not its falsity but its homogenity. Its purpose is to recast a globally celebrated Christian festival with secular elements in modern Pagan terms. But if we do that, our paganism is nothing but that same global Christianity with the numbers filed off. To reclaim ‘Santa Claus’ or ‘The Easter Bunny’ is to adopt mass-market icons. I think we have to reaffirm the importance of the local, the personal, the particular. Don’t just accept the stories you’re told uncritically and circulate them. Embrace the uncertainty and tell your own stories. I have no interest in the rosy-cheeked smiling flowers-and-ribbons choccy-box Eostre with basket of decorated eggs and fluffy rabbit that you see all over the place on the pagan Internet. But a wild-eyed Eostre, a survivor, young and rangy and half-starved from winter, clawing her way up a barren mountainside with her fox at her heels towards a blood-red Spring dawn, grinning in triumph, alive, unbroken, unbreakable? I’ll drink to her any day. Rational blogs: No, it’s not all about Ishtar. Some mythbusting Easter facts from your friendly pagan sceptic. Adrian has written numerous children’s books. Many thanks to Adrian for this interview, and for all his research on this topic.